This website is always changing and growing - check back often for updates and new additions. 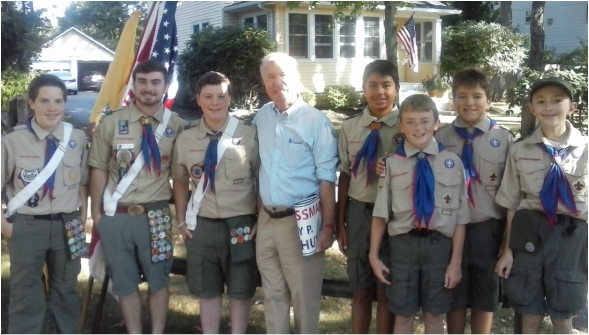 Troop 1 at the Mendham Labor Day Parade with Congressman Rodney P. Frelinghuysen. ►Parents are invited to attend the last five minutes of Troop meetings. Announcements, upcoming events and logistics are discussed. ► Pictures from Sabattis 2014 have been posted to the 'Pictures' page. ► Boys leading boys is a big part of what makes Troop 1 so special. Take a look at a practical application of that principle on the Troop meetings page by clicking here. ►PLC minutes are posted monthly. Click on PLC in the drop down menu under Troop or click this LINK (password required). ►Troop 1 wishes to thank our sponsor the Pastime Club. We congratulate Pastime on its continued support of youth organizations. Please support annual Pastime events like the Labor Day Carnival! ►Want to learn more about Troop 1's first Scoutmaster the world famous William "Green Bar Bill" Hillcourt? Take a look at the Troop History page for photographs and a full reprint of Hillcourt's essay The Life of a Serendipitist. ► Curious about recent trips? Browse the log of all the Trek Reports (password required). ► Troop 1’s Unit Identification Number and Good Turn for America Unit Numbers can be found on the Troop page. ►Troop 1’s 2013– 2014 calendar has been posted! Take a look at all that your PLC has planned! ► The "Useful Links" page has been updated to include links to the Official BSA Advancement guidelines. ► Patriots Path Council offers many specialized programs to district Scouts. ► Visit our Service Project album to see a sample of the service projects Troop 1 Scouts are working on in our community.